One thing we’re all a little short on is space; especially if you live in a major city or town. If this sounds like you and you’re struggling to squeeze everything into your home, here are some top tips for space-saving furniture ideas. Often treated as a dumping ground, the hallway is the first thing you see when you walk into your home, and if it’s cluttered and full of shoes, coats and umbrellas, it will instantly feel crowded and even more closed in. Having ample storage in the hallway that elevates everything off the floor and conceals coats and shoes is an essential step to creating a calming, welcoming environment. A slim shoe storage unit, like this one, is ideal for fixing to the wall and will help stop the hall from feeling cramped and overfull. Hanging a mirror above will reflect light and help to make your space feel larger. The bed is one of the largest items we have in our homes, so making use of the space underneath it is a no-brainer in terms of saving space. For plenty of under bed storage options, look no further than trusty Ikea as they have a large selection of options, with lids for keeping dust at bay, and wheels for easy access to your stuff. Picking the right sofa is imperative when you’re tight on space. There are plenty of options you can choose from, with storage sofas, corners and sofa beds being top of the list. A corner sofa will fit snuggly into any given space, and a sofa bed is ideal if you have lots of guests but lack a spare bedroom. 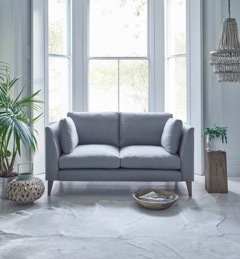 Take a look at the range of Arlo & Jacob sofas that include compact sizes and small snuggler style sofas that are perfect for smaller spaces and offer space-saving solutions. Lifting everything off the ground is a smart way to make your space feel larger. Traditional bookcases and shelving units take up excessive amounts of floor space, but floating shelves will instantly make the room feel bigger, allowing light to pass underneath. 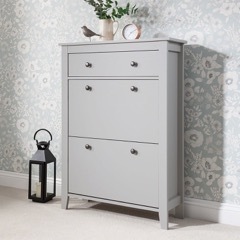 Consider ones with hidden drawers underneath for maximising your storage solutions. The Range has an extensive selection of finishes, from glossy white and black, to oak and dark wood. Think about all the places that don’t get used in your home; above the picture rail, behind doors, under the stairs, and even under your kitchen cabinets. Custom-made furniture for these areas can be pricey, but using Pinterest to find hacks and affordable alternatives is your best bet for maximising your space and clearing the clutter. Magnets are excellent solutions for hanging kitchen utensils giving you more worktop space, and are also a fun way for the kids to tidy their toys (it works brilliantly with toy cars). Consider swapping kitchen chairs for a storage bench, and a folding table will help save you space in your dining area when you’re not entertaining. There really are so many ways you can save space in your home.